We in the UK and Ireland all know this is the time of year when the golf season really starts. For years it has been the Masters in gloriously technicoloured Augusta that has been the inspiration to shoo us out of doors and dust off the clubs. For some reason, however, I seem to be trending in the other direction. As I write, my last 18 holes were at Muirfield on March 25th and barely a clubhead has collided with a ball since then. 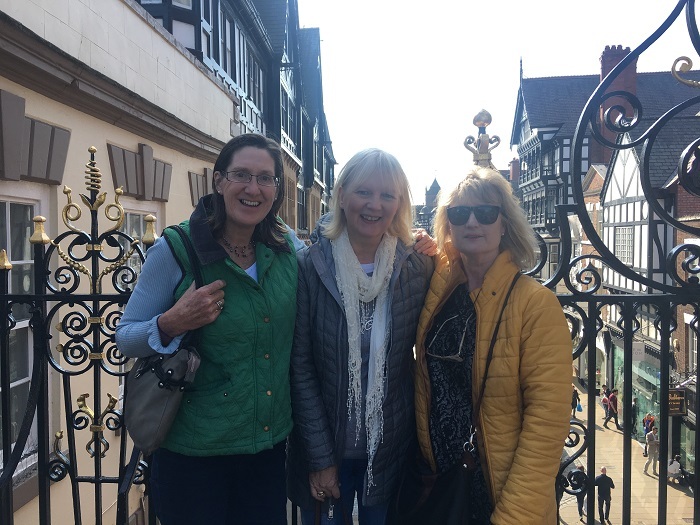 There are good reasons for that – speaking engagements; teaching commitments; family get-togethers at Easter; a week’s broadcasting at the Masters; and then, last weekend, two old schoolfriends, Rossie and Tricia, came to stay. You can’t imagine the amount of chat and blethering from three Irish women who were last all in the same room together in 1984 – or perhaps you can! With Tricia and Rossie, a rare moment of silence! Husband Brian was relieved to escape back to work on Monday. (Yes – he’s “unretired” himself.) 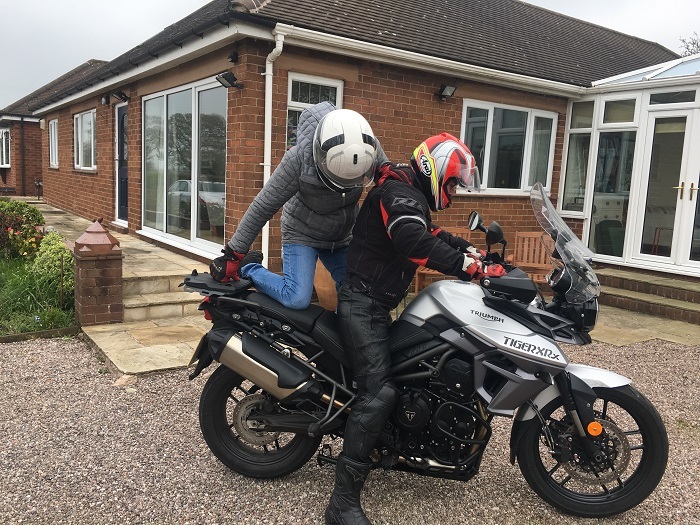 He took himself off on his motorbike on the Saturday while we walked the walls in Chester but his arrival home sparked great interest from our two visitors. 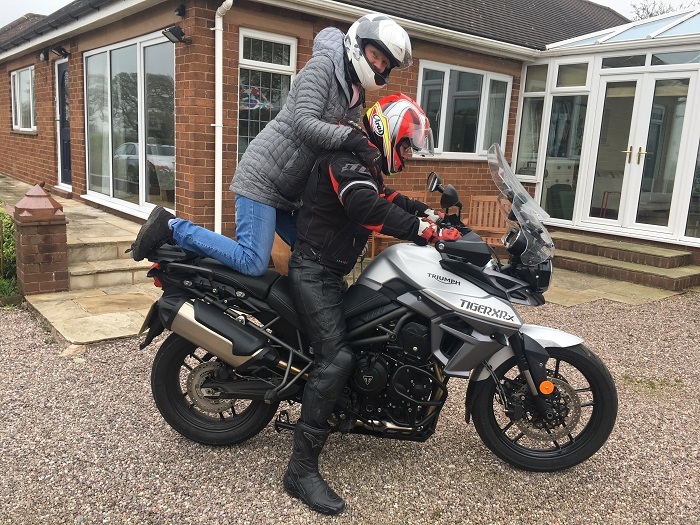 Tricia, in particular, was keen to experience riding pillion after an interlude of several decades and a Sunday outing was planned – Brian and Tricia on the bike and Rossie and me in the car. Amazingly, Brian has lived to tell the tale – and Rossie and I needed oxygen after uncontrollable laughter overtook us. Tricia’s efforts to get her leg over the bike left us doubled up. Brian braced for the strain. So, you see, there’s been a lot going on, some of it golf related certainly but not much playing of my own game. I’m beginning to find it very easy to slip into a mode of “making do” with my golf. As long as I hit the odd decent shot I seem to be settling for that and not minding too much. Where has my fierce competitiveness all disappeared to? Is it simply the logical acceptance of anno domini and of someone who no longer is prepared to practise, I wonder? That last round I played at Muirfield was foursomes. 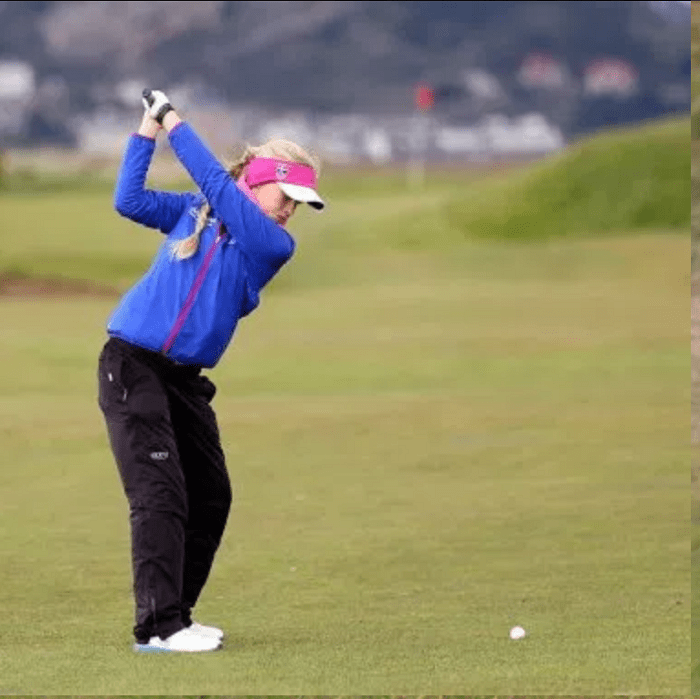 Foursomes is the name of the game at the Honourable Company and my partner for the second 18 that day was Gabrielle Macdonald, former Scottish champion and oft-capped International player who is working hard to see if her future will, indeed, lie in the professional ranks. Frankly, Gabrielle inspired me. She has reignited some competitive juices and I want to call a halt to putting up with my woeful standard of play and my mindset of the days of being a “proper” golfer being behind me. It was a pleasure to hear the sound of crisp iron shots leaving the face of the club and to witness a deft touch around the greens. And I found that I want that for myself again. I know I can do better and it’s time to put in a bit of effort. So, I’ve decided to take myself off to Somerset next month and see my old pal and former coach, Lawrence Farmer, who has retired with his wife, Sally, to cider country. I’ve had a few coaches throughout my golfing life starting with Johnny Hunter at Portstewart Golf Club and P. G. Stevenson (Stevie) at Royal Portrush. Gentlemen to their fingertips they both spent decades at their respective clubs and were both succeeded by their sons who followed suit in the longevity stakes – a couple of true golfing dynasties. As I made my way up through the ranks I had half a dozen years coached by the great John Shade at Duddingston Golf Club in Edinburgh before his untimely death. He coached me to my two British Amateur titles and I still have notes taken during those sessions. My memories are of laughing endlessly with him as we wrestled my swing into shape. Denis Comboy of Delamere Forest was another who made lessons so enjoyable and spending time with him on the practice ground was never a chore. But, with all due respect to these fine teachers, Lawrence is by some distance the best coach I’ve ever worked with. This has sometimes been to his detriment as, during his time on the Seniors Tour he was in such demand from his fellow competitors wanting him to cast his eye over their game that I’m sure his own golf suffered for it. Anyway, I’m off to see him next month and I just can’t wait. No more dampening down of my passion for this game. 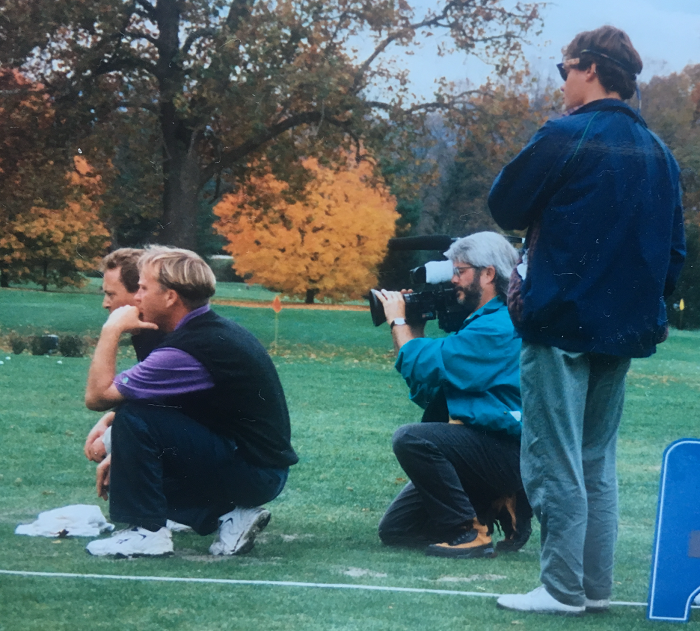 Lawrence, front left, in the 1990s, studying Sam Snead swinging hickory-shafted clubs. Always learning. So, now that the sun has finally made a welcome appearance it’s time to flex those golfing muscles. No matter what age or stage you are at your enjoyment will be enhanced by a few lessons with a PGA coach. We can’t do it all on our own – a set of eyes on us does help and, if you choose the right coach, you’ll have a lot of laughs along the way. There’s golf all over the place this weekend – Los Angeles, Morocco, San Antonio, Zimbabwe, Aston Wood, to mention just a few of the venues. 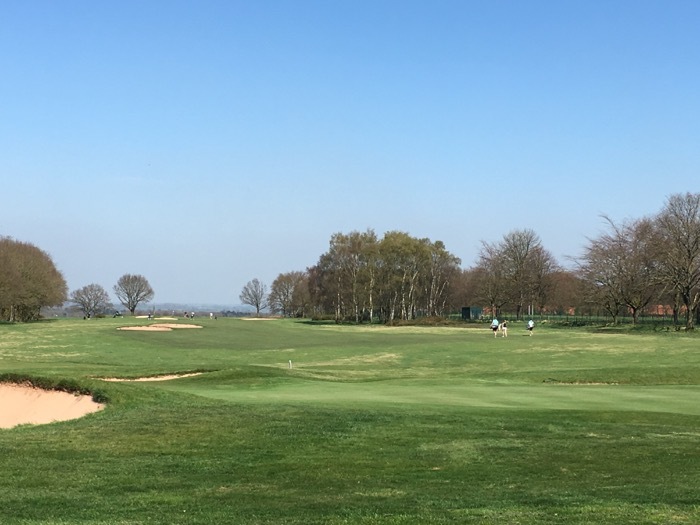 Closest to me will be Aston Wood in Sutton Coldfield, where we Whittington Heath women will be trying to get through to the second round of the Taskers Trophy. We won the first leg at home, by the narrow margin of 4-3, so it’ll be a tough ask. It’s 7-a-side, off handicap and from the look of the weather forecast, we’ll have to root out the sun hats and sunscreen, hoorah. Will the blue skies last? It’s also the London Marathon this weekend and I’m not sure the thousands of runners will be cheering at the thought of sizzling in the sun for mile upon tortuous mile. Last weekend, unexpectedly, I found myself watching the end of the marathon at the Commonwealth Games on the Gold Coast, where the hot and humid conditions turned the race into a bit of a war of attrition. A Scot called Callum Hawkins was leading by some distance, so I didn’t go to bed but kept watching, intrigued that a Scot was about to win gold in such alien conditions. How on earth was he managing? It was distressing to watch as Hawkins started weaving and wobbling, crashed into a barrier, pushed himself off, wobbled on, threw off his cap, hit the kerb, tried to get up again and, at last, stayed down. I, like many others, was screaming at the telly as the medics seemed conspicuous by their absence but marathon runners are a hardy, sometimes foolhardy breed and help means disqualification, hence, presumably, the reluctance to intervene too soon. 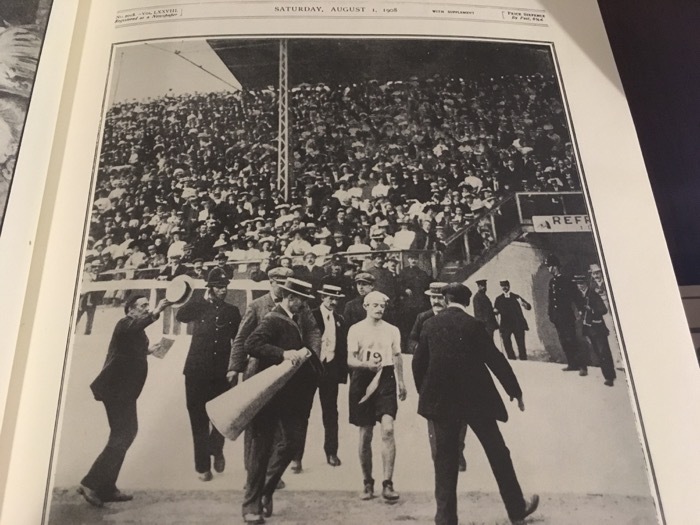 Dorando Pietri, of Italy, was disqualified in the 1908 Olympics in London when he staggered and fell several times and was helped over the line at White City after reaching the stadium well ahead of the other runners. Queen Alexandra insisted on meeting Pietri and presented him with a cup and he became more famous than if he’d won. At least Pietri and Hawkins survived, thank goodness. The first marathon runner, the bloke who ran from Marathon to Athens with news of a famous victory, completed the 26-odd miles, then collapsed and died. Never having been much of a runner – too lacking in puff, 100 yards was about my limit – I am in awe of those who tackle long distances. I also think they’re cracked but there’ll be loads of heart-warming tales in the run-up to London and I still laugh about our friend who nearly had to run carrying one of his Dandie Dinmonts. That’s a small Scottish terrier with a long body and short legs and it wasn’t quite a case of “the dog ate my homework” but “the dog ate my microchip”, the chip that identified its owner as a bona fide entrant in the race. They believed him in the end and the offending Dandie stayed at home. Perhaps I really should just make a bit more of an effort and try breaking into a shuffle before I seize up altogether? I’ll give it some thought…. 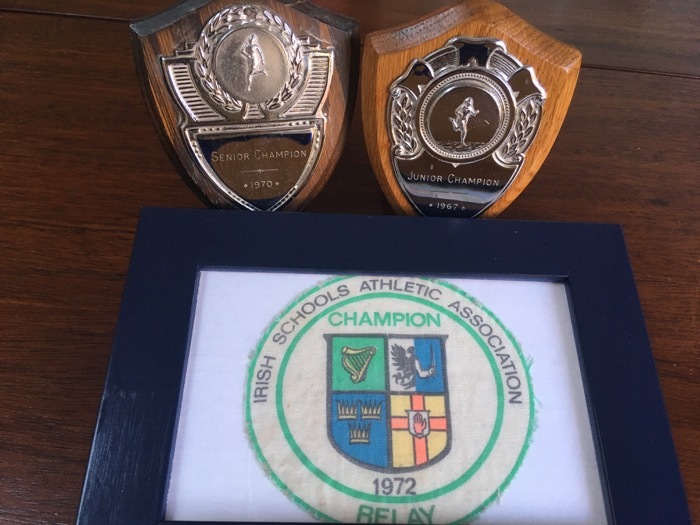 For those of you who doubt my athletics credentials, I have rooted out one of my most-prized possessions: the badge that denotes a winner of the All-Ireland schools relay. The badge may be frayed and faded but I won’t be throwing it out! It was the 4 x 100 (still yards in those days I think) and I ran the first leg, from a standing start, no blocks (too technical for me). We were in the outside lane but one and I ran like crazy round the bend but didn’t feel I was making any real impression on the girl outside me. I passed the baton without mishap and turned round to see that the others were all still running, still some way from making their handovers. Sheila Weir, Sally Lelievre and I had to give our last runner a good lead because one of the other last leggers had won the individual 100 and 200. I legged it across the infield to see the finish and a couple of priests asked who they should be cheering for. “Carol Ann,” I wheezed. “Come on Carol Ann,” they roared and come on she did, holding on to win by a Grand National nose. 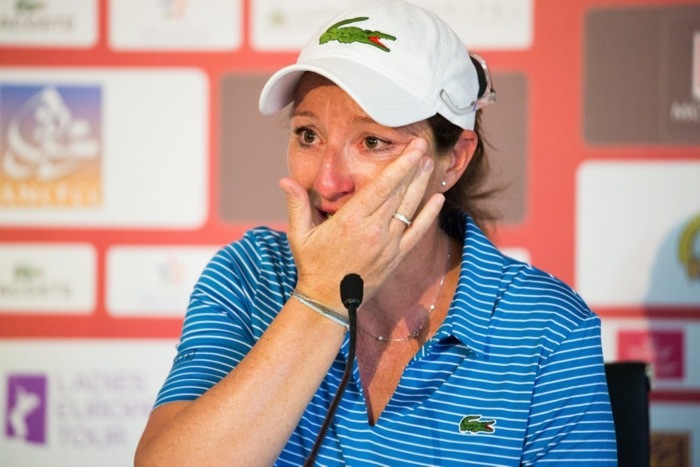 Marvellous memories and Gwladys Nocera, who has just announced her retirement from the fray of tournament golf, should also have plenty of those. I think I first met her at the Ladies’ British Open Amateur Championship (to give it its full title) at Little Aston in 1998, when she was beaten in the final by Kim Rostron. Gwladys trained on to become one of France’s most successful professionals, winning 14 times on the women’s European Tour and playing in four Solheim Cups. Now, at the age of 42 (43 next month), she is expecting her first child and will be working with the French Federation to encourage and support the next wave of players.